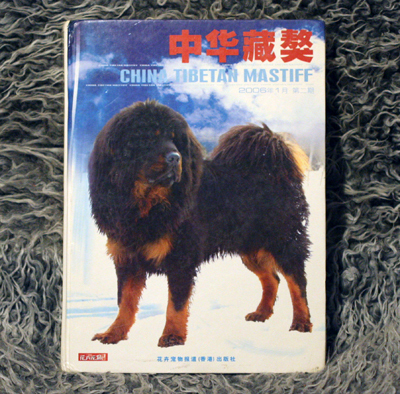 The Tibetan Mastiff books on my bookshelf! I love this book! The pages are of high quality glossy paper, the photos are sharp and beautiful and it's a joy to look at every single page. Sure, I've seen some of the photos in other books, but on this glossy paper the pictures really stands out! The text is in chinese, but never mind that. This book should be on every bookshelf of every TM fan out there. If you can you should really get your hands on a copy. I promise, you will not regret it. A small book, lots and lots of text, but the handful of photos in it show dogs that are, for once, not angry with the world. I get a feeling this book is old, but searching on the net it seems it was printed not too long ago. The photos look old, the pages feel old and as a big fan of old books I love it. If it's new, well never mind, I still love it ;) Perhaps it's because of the pic on the cover. I adore the look on this wise old TM's face. Again, a chinese book. No english in it at all, but quite a few photos. But I have to say I'm not a fan of them - the dogs in alot of the photos are put there afterwards. In other words - a big fan of photoshop was responsible for this. It gives a false image of how the nomads keep their dogs and... well it just seems fake. This being said I would not want to be without this book! The pictures (the unaltered ones) are lovely and the photos from Tibet are as well. All text is in chinese but there are plenty of pictures to enjoy, most are new for me. Alot of the books I have show the same photos, over and over again, but this is not the case in this book. 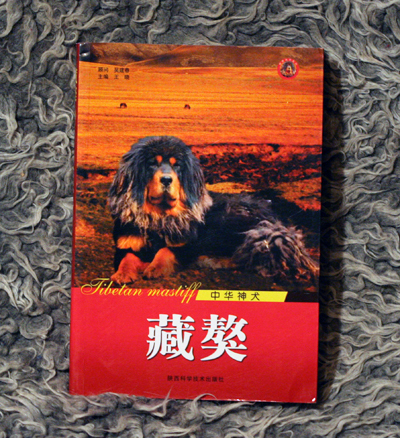 Tails and paws are compared and you can get most of what the book is about without knowing any chinese at all. 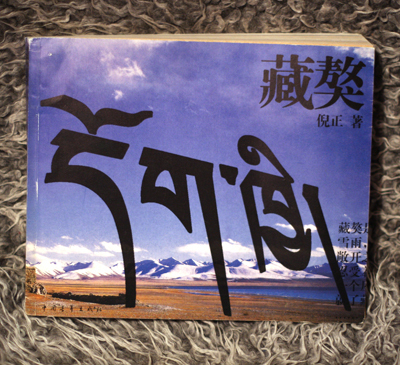 A wonderful book full of pictures from, what it looks like, the plains of Tibet. 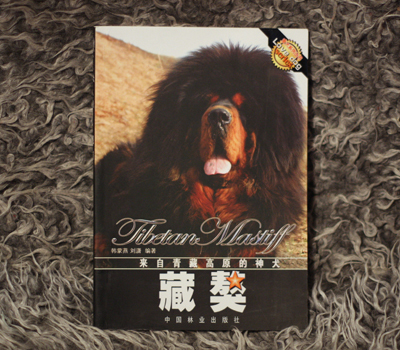 The text is in chinese but there are big photos to enjoy and I can't help but love the way this book smells ;) It looks like a different edition of Picture biography about tibetan mastiff (scroll down to view that book). I can only say good things bout this one. Love! 316 pages of love! Text dominated this 449 pages thick book. Text in chinese that is. There are a few pictures in black and white. There really isn't much more to say other than I really wish I could read chinese! Lots and lots of wonderful color photos in this BIG book! I love the quality of the paper and it's a wonderful book to flip through. I do so, time and time again ;) There are kennel advertisments here and the text is in both english and chinese. It's nice to learn a bit about the dogs in the pics, like how old they are, how tall they are and how much they weigh. 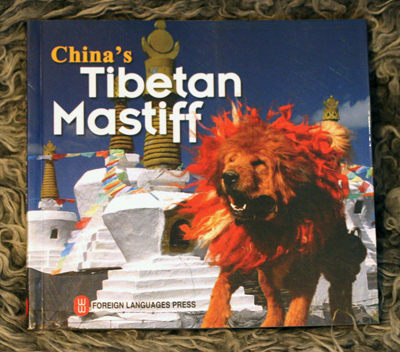 ALOT of furry chinese TMs in this book (as in all other chinese TM books I have). There are several chapters on the breed as well, but the english language in this one is sadly not the best. 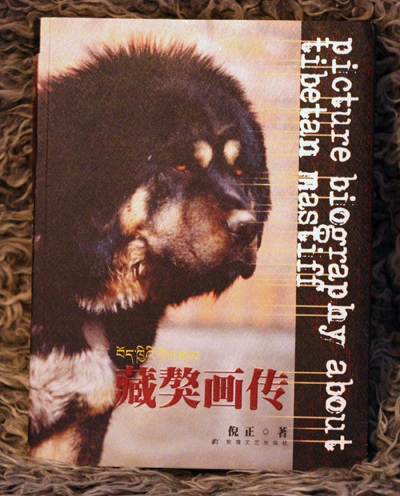 The text in this book is in both chinese and (poor) english and once again the dogs in the photos are simply fascinating. Half the book consists of text and pictures. You can read about the history of the breed, diseases, training and so on. Too bad it's so hard to understand the english text. The other half of the book consists of kennel ads. Everything is in color and it's really great to just look at photos and enjoy the dogs. 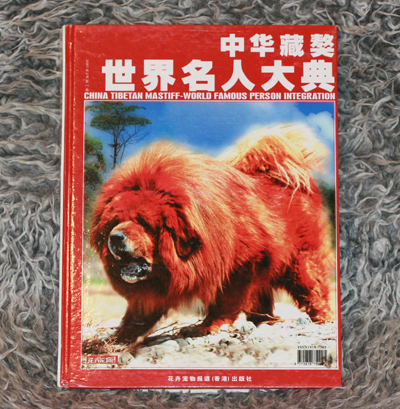 Part one of four books presenting breeders of Tibetan Mastiff. This book is packed with photos of beautiful TMs and interviews with famous TM breeders in different regions. The chinese breeders give their point of view and it's very interesting to compare to the way we westernes view the breed. This book has 188 pages and countless photos of TMs in every possible shade! The text is in both chinese and english. 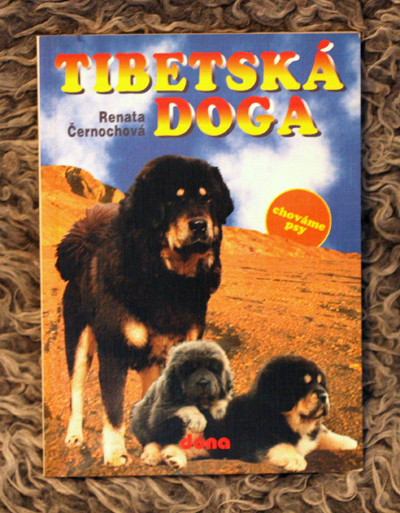 Part two of four books presenting breeders of Tibetan Mastiff. This book is, just like part one, packed with photos of stunning TMs and interviews with TM breeders in China. The text is both in chinese and in english and it's very educational to read their views on TMs. Alot of different types of TMs are presented here, just like in part one and two. 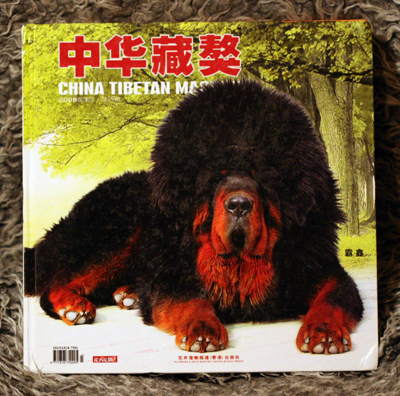 The Tibetan Mastiff is, in my personal opinion, really just a name where several different types of dogs are gathered. Sure, they all have similarites, but one have to wonder - should they really belong to just one breed? It's a shame to loose the variety developed during the centuries, just because people outside of the original country pushed all these types into one single name. This book is also full of interviews with chinese breeders and alot of photos of TMs. Book four of four in the series "world famous person integration" takes a look at breeders outside of China. There are interviews with breeders all over the world and their views on the breed in general and the situation in their countries. It's very educational! I enjoy this book alot! There are alot of wonderful photos and the text is in both chinese and english. The only bad thing about this book is that it's so hard to get a hold of. It took me quite some time before I finally found a copy for sale. HEAVY! Yes, this book weighs 3,15 kg (6,9 lbs) and is packed with goodness. There are photos, photos and photos of wonderful TMs and the text is in both chinese and english. 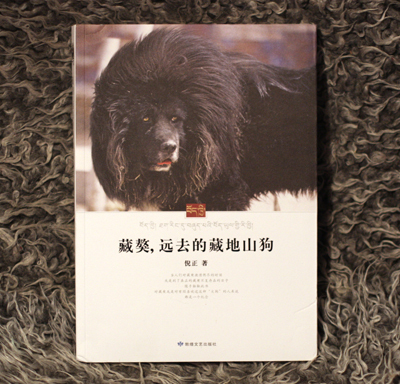 There are several chapters: History and development of TM, Organizations and standards of TM, Breeding and management of TM, Heredity and breed of TM, Training of TM and celebrated kennels in China. 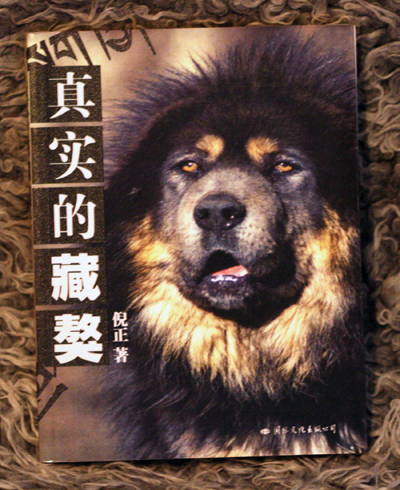 There's also a chapter on the Snow Mastiff (white TM), a very sad story of the loneliness of being different. The book is big, heavy (but not fluffy) and in both english and chinese. The english is not perfect but it really doesn't matter much since it's still full of very interesting reading. For example the chinese author compares the way we keep TMs in the west with the way they keep TMs in China. What we want in the breed and what they want. It's great to get to see things from their point of view. They view their breeding as an industry, at least that is the word used over and over again. Interesting reading and nice pictures (even if some are obviously enhanced in one way or the other) is all I ask for in a book. This book is completely in chinese and I can't make out much. There is a chapter on the history of the breed with some nice artwork showing (according to the author) TMs. 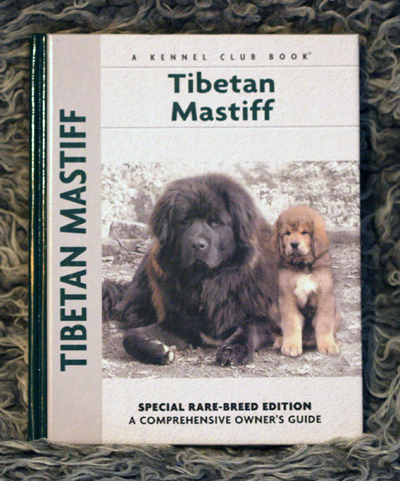 There is also a chapter on the origin of the breed - is the TM a descendant of bear or wolf? That seems to be a question asked here. The book is in full color and there are alot of nice photos of beautiful dogs. Especially one caught my eye - a brindle TM. Not very common, I'm sure, but I remember seeing one on a german website a while back. There is a total of 152 pages of chinese writing mixed with stunning TMs, and for once the chinese doesn't portrait the TM as a savage beast ready to gobble you up, at least not in the pictures. The text could say anything without me understanding a word ;) I enjoyed this one alot! 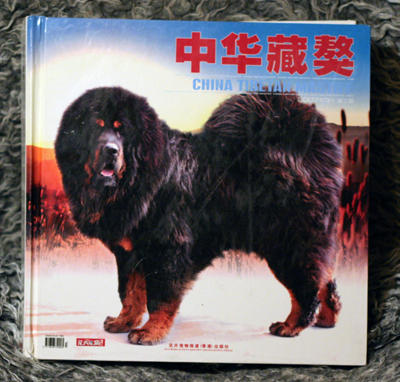 This is a big and heavy book packed with color photos of Tibetan Mastiffs from China. There is a part of the book translated into english, but I'm sorry to say the english is not the best. With a bit of imagination you can pick out the information from the text. There are different stories of how the TM came into being and also one part on their characteristics. For me this book is pure eyecandy even though almost all the dogs are pasted into other backgrounds (like forests and mountains). 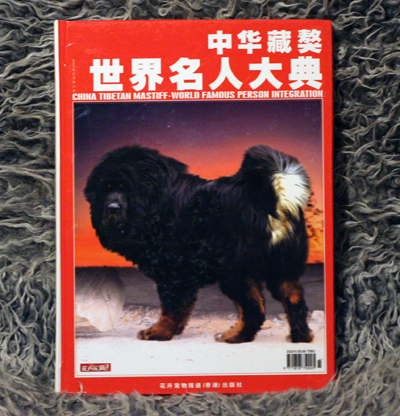 It's mainly focused on the heavy and furry TM that seems to be the most popular one in China. 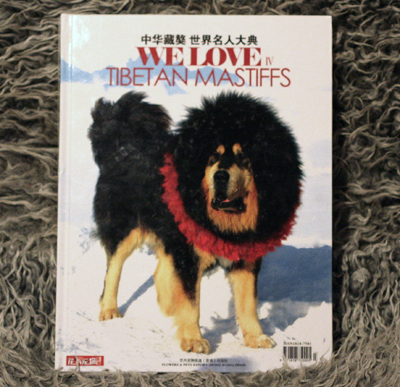 The whole books is about advertising different Tibetan Mastiff gardens. Every spread is full of impressive dogs, some facts about them and adress, e-mail, phonenumber to the TM gardens. One of my first TM books! 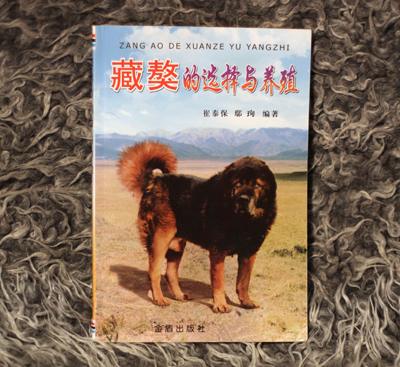 This one is printed and published in China, but it's in comprehendable english and there are lots of gorgeous pictures of TMs living on the plains, guarding their people. It's not a very thick book (only 100 pages) but the high quality photos, the informative text and the glossy paper inside should make every friend of the breed happy. There's a chapter at the very end dealing with how to get along with a TM. If you skip past this I think this is a very enjoyable book. As far as I know it's still available on Ebay. 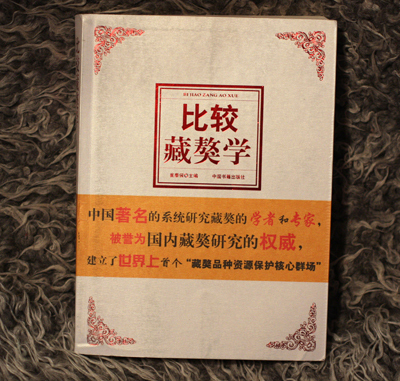 I don't know chinese but it certainly doesn't stop me from enjoying this very nice book. There are pictures of alot of TM types, both the heavier one and the smaller and lighter one. 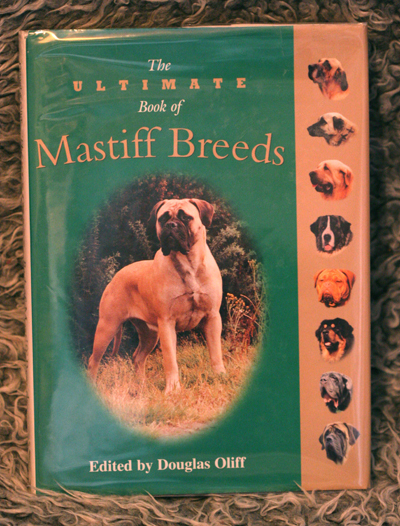 This is a treasure for me since I am a big fan of all the mastiff breeds. 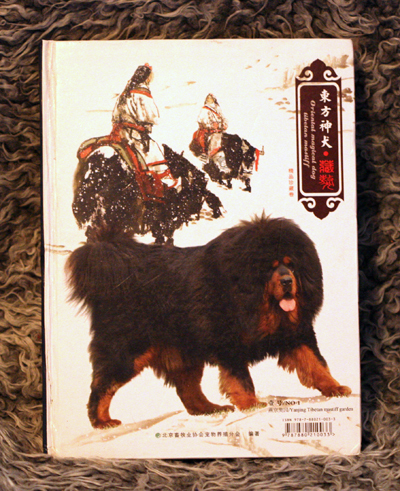 It is a very nice book with both historical facts and character descritions of the different breeds. Informative and interesting if you are the least bit curious about related breeds as well! The title is true to its words! This book is full of pictures showing the TM in many different situations. 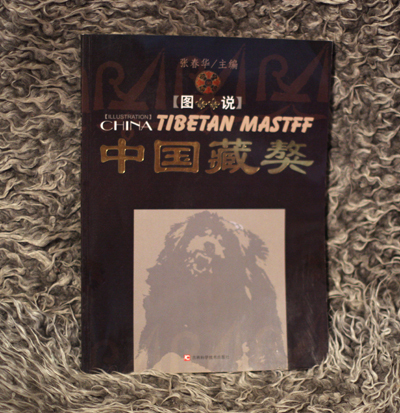 The book is in chinese but the index is in english so we will understand what we are missing out on ;) There are alot of pictures showing TMs on the plains, chained to poles or roaming freely. There's a great varity of TMs in the photos. Both heavy ones and lighter ones, hairy ones and smoother ones. Very interesting picture material for those interested in such things. If I were to rate this book I would give it a top score! It's excellent and very educational. My favorite TM book this far! 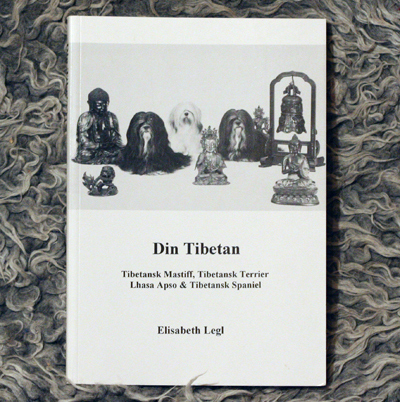 It jumps into the history of the breed, or should I say it's full of historical accounts from travelers finding their way into the remote Tibet. It's very interesting to read about the dogs in their native country some 100 years ago and how they were viewed by people who were accustomed to the western breeds. There are some black and white pictures of TMs, mostly drawings but also some photos. 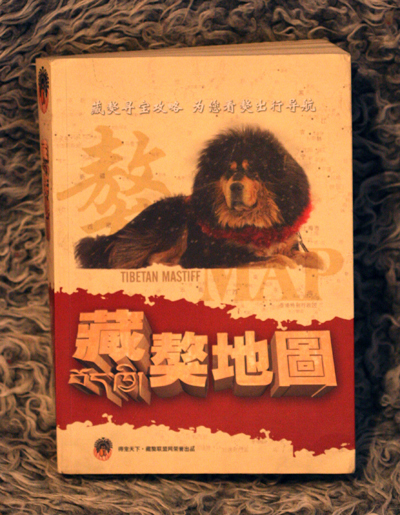 If you wish to see the Tibetan Mastiff through the eyes of people who never knew such a dog even existed, then this will be a treat for you. 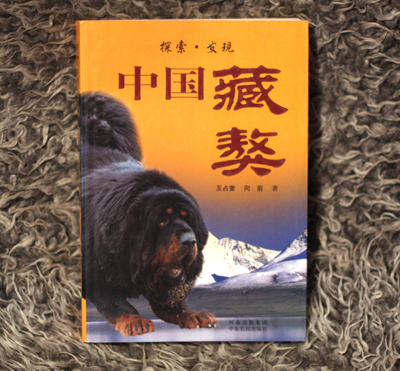 This book is a smaller and older version of Picture biography about tibetan mastiff. The pictures inside are pretty much the same but there are far more pics in the newer version. The text is in chinese. I must say the new version is much more interesting than this one, but I am sure I would have loved this book if I didn't have the new and updated edition. This one is written by Zodd's breeder Jarmila. It's in czech language. 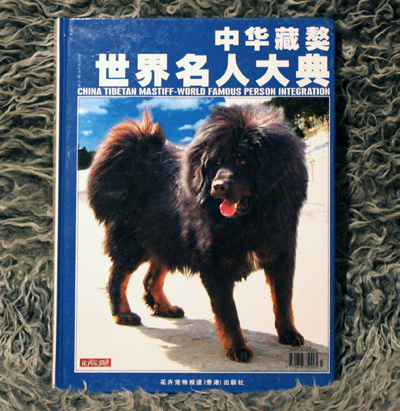 There are chapters from different countries where the breed is presented with photos and text. I really like this book and I am sure it would be a wonderful source of information if I could only understand czech. There are pictures of both Zodd's mother and father, and also alot of other relatives and ancestors. 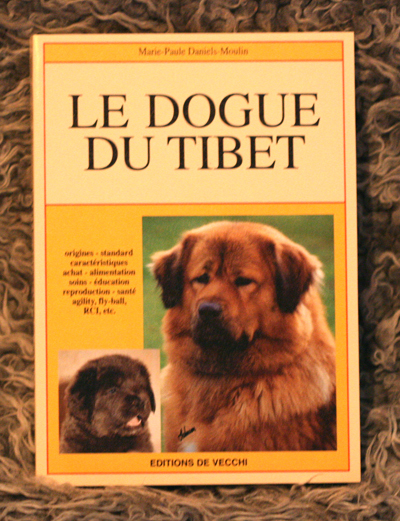 The chapters range from the other dogbreeds in Tibet to health, breeding and colors in the breed. One more book from a czech breeder. There are mostly black and white pictures and a few in color. Oh yes, I seem to be obsessed with the pictures in books, but when I can't understand the language I at least understand the photos. There are quite alot of historical drawings in this one and even a chapter showing TMs on stamps! This is a treat for me since I am a collector at heart, the only negative thing would be that the pics are in black and white. Hm, I'm not sure what to write about this book. There are eight chapters dealing with history, characteristics, breed standard, your puppy, proper care, training, healthcare and showing your TM. I can honestly say I got scared when I read the "serious things to consider before acquiring a TM" section shortly after Zodd moved in. It was pretty much a finger pointing my way telling me that I had invited a destructive monster into my home... Well, I closed the book and put it on my shelf, not daring to venture further in fear of returning Zodd. Yes, that was pretty much the negative feeling I got from the book. It can perhaps be of help to people willing to look past the warning fingers that constantly appear, but to me this book will always be a bit scary. 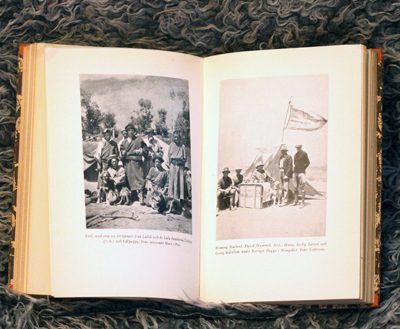 This book is pretty much a journal about the dogs the swedish author and adventurer Sven Hedin met during his trips in Asia 100 years ago. It's an interesting glimps into another time and another way of living. 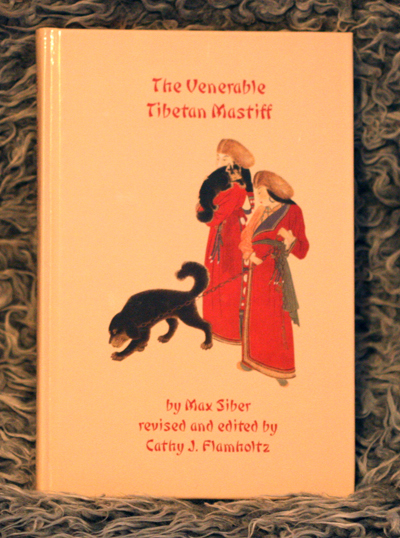 The pictures does not only show TMs but several other types of dogs that Sven journeyed with. 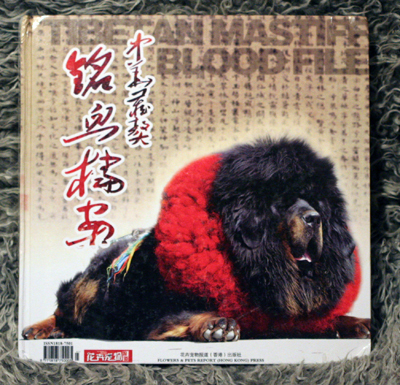 If you are at all interested in breeds from asia then this book could be of interest for you. Well, there is one problem - it's all in swedish. This book is in swedish. 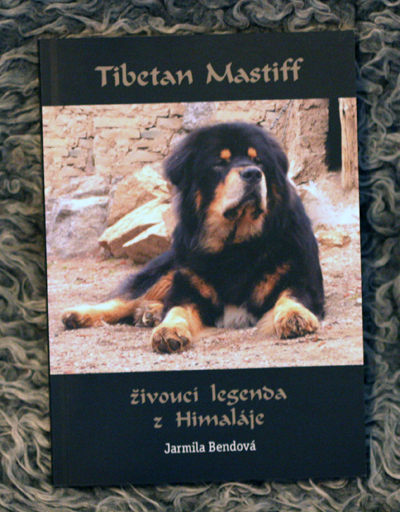 It covers all the official tibetan breeds - Tibetan Mastiff, Tibetan Terrier, Tibetan Spaniel and Lhasa Apso. 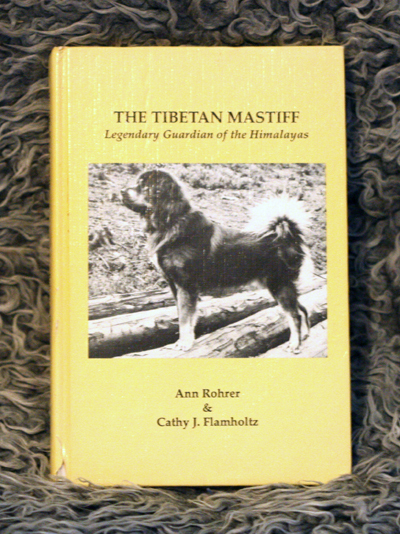 It also covers some of the history of the mythical country of Tibet and how to care for your dog. It's a very interesting book, especially the part on the TMs introduction to Sweden and the situation in other countries. The book was published in 1999 and alot has happened with the breed in Sweden since then. There are some pictures of the early dogs here in Sweden and it's very nice to put faces to names seen in so many pedigrees! None of these books are for sale, they are from my personal collection.